I can’t believe this wasn’t the very first thing we posted. How did we miss it? Nettle and Friends is our very favorite tea – it’s the first thing I think of in nearly every situation. It’s high-mineral, high-vitamin, and full of anti-oxidants. It’s good for your kidneys, your liver, your blood, your lymph, even your adrenal glands. It can’t be beat in allergy season, and taken a week before menstruation, greatly assuages PMS. Is there anything this amazing tea can’t do? It even tastes pretty good! 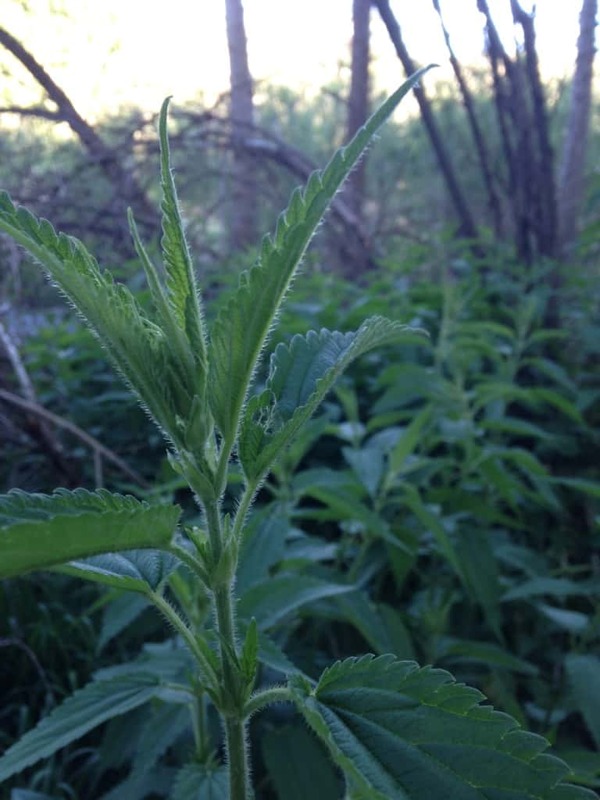 Nettle nourishes the kidneys, and has some fairly strong anti-histamine action. Dandelion is a diuretic that won’t deplete your potassium levels. Red Clover is great for moving lymph and thinning thick cloggy blood. And they all are tremendously high in nutritive value – minerals, vitamins, anti-oxidants galore! Licorice is one of my favorite plants for adrenal support, and in this formula it also provides a bit of moistening action, and great taste too! 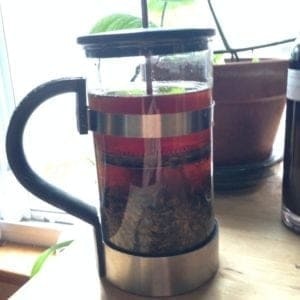 A long infusion steeping in a French press. If you just leave it at that, you have an amazing wonder tea. But for variation, you can also try adding Rose Hips for amazing vitamin C and bioflavinoid content, with a pleasant sweet-tart taste! Ginger is warming on a cold day, and good for digestion and circulation. Peppermint tastes great, and is a relaxing, uplifting treat for your nervous system. And Marshmallow leaf is excellent, if Licorice doesn’t agree with you, to provide a bit of moisture to the otherwise slightly astringent formula. I like to make up a very strong infusion (about an inch of dried tea in the bottom of a mason jar, then add boiling water), letting it steep for 4-8 hours. Often I will make it before I go to bed, then have it ready to drink for the next day. Letting it steep long like that drastically increases its mineral value: a 10- or 15-minute steep gets you 5mg of calcium per cup, but steeping it for 8 hours gets you 500mg per cup! The other minerals have similar profiles, so it really pays to get into the habit of setting it up before you go to bed for the next day. You can just put it in your water bottle, or add hot water to it to warm it up again, as you like. You can’t possibly have too much of this tea, though if you’re taking blood thinners, it’s a good idea to check with your practitioner first. Check out our Online Herbalism Programs individual modules on specific topics or entire courses designed to build your confidence as a skillful herbalist! Just made a batch of wonderful Nettle Pesto (or Pesto d’Urtica if you please). I made a variation based on what I had handy, pecans instead of pine nuts, rice wine vinegar instead of lemon juice and it came out beautifully. I blanched them first, reserving the juice for drinking and for rinsing through our hair after a shower. It was my first attempt and I will definitely try it again. Thanks for the tips! Where do I buy this tea? you may be able to find all the ingredients at a local co-op or natural foods store near you that sells herbs in bulk. you can also buy the herbs online. Mountain Rose Herbs is a trustworthy and high-quality supplier. Curious about the safety of this tea while breast feeding? this tea should be quite safe while breastfeeding or pregnant.